If you want inspirational, then you can’t beat social media. How we continue to bumble along as we do, awash with such powerful messages, must be a testament to humanity’s ability to ignore good advice. Just say we took even a fraction of the good advice that we have access to. Wouldn’t we be such unbelievably powerful and efficient individuals? The other side of the coin is, of course, what would happen if we took even a fraction of the good advice, that we so confidently offer to all and sundry, ourselves? There are people out there who do all this stuff. They regularly take all their lemons and make lemonade. They constantly start journeys of a thousand miles with that first small step. They welcome change with open arms. Every single thought they think is positively positive, and never would they think of taking any action that didn’t stretch them to their extreme extremity. Luckily, for the rest of us, they are the exceptions that prove the rule. So there’s no need to panic. It’s fine for us to just sit here, bemused by all the hullabaloo, shaking our heads and wondering, just where do they get the energy? 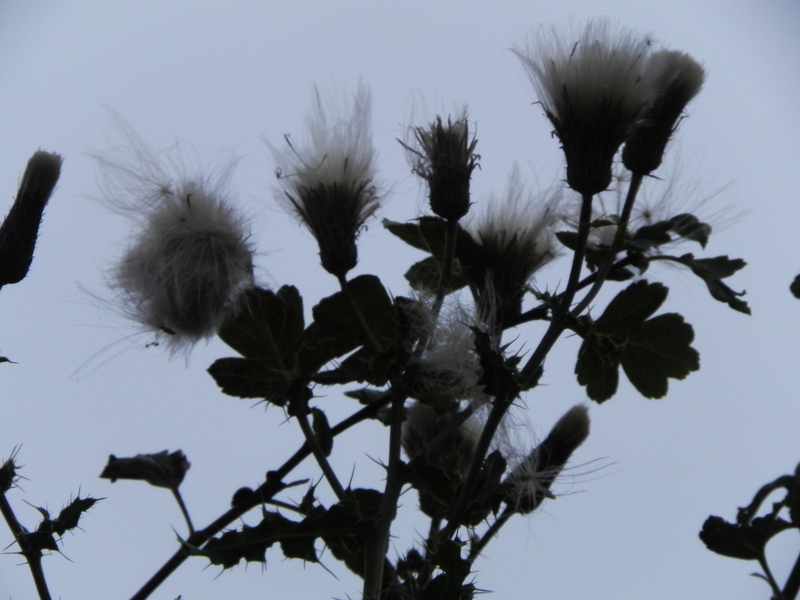 Talking of the exceptional, the hedge in today’s photo is a good seven feet (two and a bit metres) tall, and sticking out the top of it we have – a thistle. Surely, there must be an inspirational message here, somewhere. Indeed, where do they get the energy? You know how they say, you’re only as old as you feel? Well, if that’s true, then I’m at least 80 years old. 😛 Love the picture, David! Hi Miranda – you’re right – some days!!! !